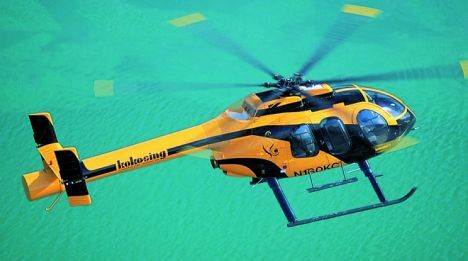 Discussing the "Colibri" EC 120 B, we saw how one could limit tail rotor risk by boxing it into a "fenestron" casing. But some manufacturers have gone a step further by managing to do away with the tail rotor altogether. What exactly is this small rear propeller for? Thanks to the third law of dynamics, the engine engages the main rotor giving it a constant but inverted action which is normally neutralized by the tail rotor. The variable pitch of its blades is controlled by the pilot's foot pedals. 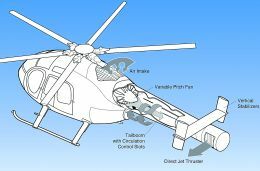 Therefore by acting on the pedals the pilot is able to have the helicopter gyrate around its own vertical axle (known as "yaw"). Instead, the MD 600 N which we are now examining, opposes the twin rotations by way of extremely clever aerodynamics. The tail boom is housed in a thick carbon fibre enclosure. A variable-pitch fan driven by the main transmission blades blows rotating air into it. Longitudinal slots and the air flow generated by the main rotor into the boom, bring about an aerodynamic reaction which provides a significant amount of main rotor anti-torque. Lastly, air exits the tail boom through fairings providing further resistance (not un-like the bow-thrusters on boats) thereby making the helicopter's rotation on its own axle possible. This rather clever solution is called "NOTAR", as in "NO-TAil ROTOR" (not to be confused with NOTAM of course which in aeronautics is the equivalent to "Notice to all Vessels" for those at sea. From a more general point of view, the MD 600 N is a light, single-turbine helicopter which can seat up to eight. The double centre-opening doors (just like those on a van to be clearer) allow for it to be gainfully employed for shipping cargo (up to approximately 900 kilos). The MD 600 N has a rotor of limited diameter (8.4 metres) with six blades. Its total length measures 10.9 metres to be reduced to 9 if one doesn't take into account the front end protuberance of the blades. It certainly represents the most "avant-garde" version of the more traditional MD line which have made rotor blade history worldwide.